Den perfekte getaway på 20 dekar av privatliv, med utsikt Flat Bay i Harrington, Maine. Sytti-fem meter fra land, er dette et spesielt sted for fred og ro, bygget med dimensjonale trelast, bordet og shingled i sedertre. Det er fri for mange allergifremkallende elementer. Alle bekvemmeligheter du forventer i en helårsbolig, i en setting av seg selv. En kopi av en borgerkrig generell hjem, går du inn fra verandaen til en stor stue, en spisestue med utsikt i den nedre delen av tårnet. Det er et fullt utstyrt bysse kjøkken, ett soverom med dobbeltseng, rikelig med skap, og et komplett bad. Opp de svingete trappene er en kunstners studio og en øvre nivå av tårnet med en balkong hvor en pult på vinduene inviterer forfatteren. Det er havutsikt fra alle rom, varmluft varme, internett tilgjengelig, og huset er møblert og applianced inkludert en telefon. I motsetning til på mange leie, vil din nestes byggeprosjekt ikke bli en del av ferien. Personvern er fullført. Ligger på 20 private sjøen dekar eiendommen tilbyr en mulighet til å utforske kysten og skogen. En liten dam er et herlig sted å observere livet i vannet og vannliljer. Havnen og øyturer, en stat park, og dyreliv tilflukt er bare 10-20 minutters kjøring. A beautiful secluded piece of heaven. Everything on the website is accurate. Comfortable bedroom, the bonus writing/art nook overlooking the cove, kitchen has everything you you need for time away. Near but not too near, Acadia National Park and other sights including Campobello Island.The property is expansive with lots of shade trees and overlooks a cove with sunrises. The night is filled with stars with no city lights to obscure your view. a wonderful place to "get away from it all and recharge yourself with beauty. This year was my second stay. I really enjoy my time in northern Maine when having this as my base camp for hiking and drives throughout the area. I would readily recommend it to any other potential visitor to the bold coast. It is always a pleasure to have you stay at Oak Point . My stay at the Harringtons' Victorian Cottage was everything I wanted and needed it to be. The cottage is extremely well equipped for a comfortable stay. And the Harringtons are charming and delightful people as well as responsive and helpful Hosts. I will book again at my earliest opportunity. Perfect place to getaway! We loved everything! Where do we start...we found Rod and Lucille’s gem while looking for a place to get away and celebrate our fiftieth birthdays. We wanted somewhere that was central to the east coast of Maine but not in the hustle and bustle of a tourist area. Well, this was definitely, the place. We were about an hour and ten minutes away from Bar Harbor and about two hours from Canada and whale watching. 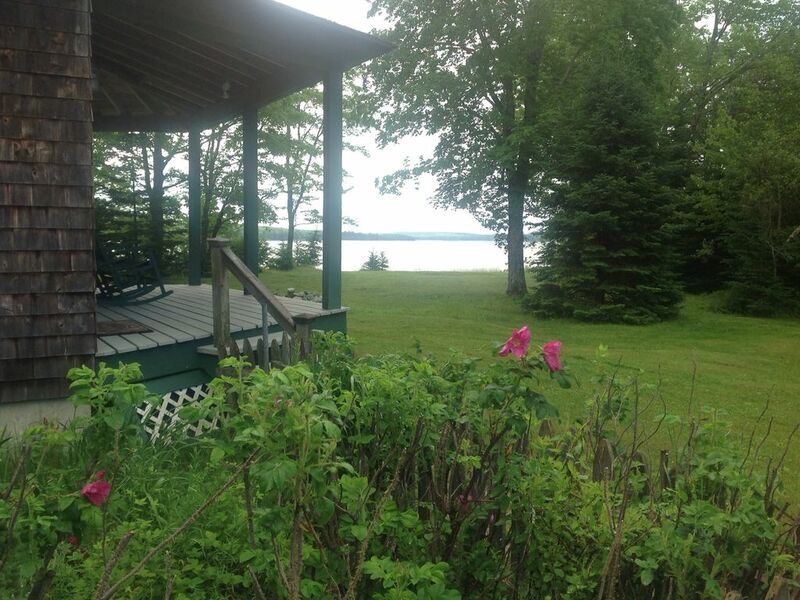 The location is not the only thing that is perfect...the cabin is beautiful and has all the amenities. For starters, the picture on the site just doesn’t do it justice. The living room is so cozy and inviting and the upstairs loft that allows one to look out over the bay is mesmerizing. The bathroom is just the perfect size and the bedroom has room to hang up your clothes and put away your belongings. –The bed is comfortable too! The kitchen has everything one would need to cook a wonderful “home” cook meal and what more could anyone truly need? We enjoyed our days out exploring and our morning and evenings out on the porch our down by the bay being serenaded by our new frog friends or watching the light show of the fireflies. We can’t forget to mention the bunnies on the property that greeted us every day. We just can’t say enough about how wonderful our experience was at the Harrington home. Thank you Rod and Lucille for making this a wonderful week and a vacation of a lifetime! We did two whale watching trips, and visited a few towns and watched fireworks across the bay on the fourth of July. Everything was just perfect! God Bless you both and we hope to return in a few years. It was our pleasure to share our home with Kim and David and certainly look forward to their return. They were the perfect guests. We stayed June 23-30. We loved it. The cottage is exactly what we both enjoy and were looking for- somewhere that felt isolated and away from people and noise, but close enough to travel for day trips and food. The pictures look exactly like the house and land. It’s perfect. Some days were cold enough for a fire and there’s plenty of wood available. Coming from a hot climate, that was a treat in the summer. We took a wonderful day trip to Bar Harbor. We hiked the Petit Manon trail to a beautiful rocky coast. There are many wonderful things to do within a short drive, but you’ll probably also want to stay in and enjoy the cottage, the animals you’ll see and the beautiful view. Rod and Lucile are wonderful hosts. If we make it back to Maine we definitely plan on staying here again. It was perfect. This property was splendid in every regard: the paired chairs overlooking the water, the spacious private grounds, the homey interior, loads of firewood (oh, we loved our evenings by the fire, including the glowing eyes of the owl andirons). All soo private, yet conveniently near town. The owners just a phone call away if needed. All the amenities and then some. We give this getaway our highest marks.